Sight, touch, smell, taste and sound. They are the five senses that define all human experiences. And all of them except taste (maybe) are also what defines your motorcycling experience. However, the one sense that rules above all has to be the sound. The sound that a motorcycle makes has to be the most defining characteristic it has. The growl of a V4, the scream of an inline-four and the whine of a triple are all examples of one of the most defining traits of any motorcycle. And today, my head is about to explode, thanks to all three of these delivering their music to my ears one after the other. This has to be the most unlikely set of motorcycles we have brought together. An exotic Italian, a Brit brute and a Japanese assassin. And each of them with a soundtrack of its own. What sounds like a turbine and has the potential to snap you in two if you don't know what you're doing? The Speed Triple, of course. 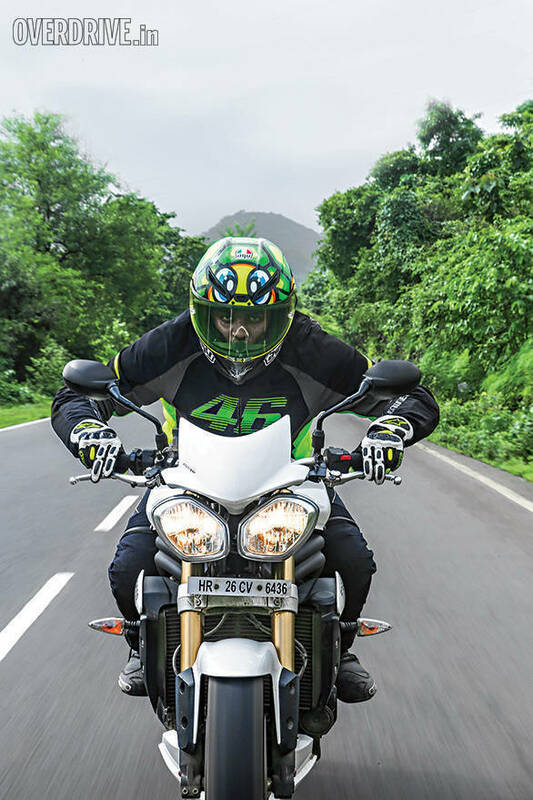 With its 1,050cc, three-cylinder engine putting out 127PS of power and 104Nm of torque, the Speed Triple is a fast machine. And I'm talking about 200kmph+, 3.89 seconds to 100kmph kind of fastness. It is one of the first of the super nakeds and was initially based on the near litre-class Daytona. And in typical super naked tradition, the design is beefy and muscular. The twin headlamps and that tiny wind deflector combined with the underseat exhaust make for an instantly identifiable design. Except when parked next to its smaller brother, the Street Triple, of course. 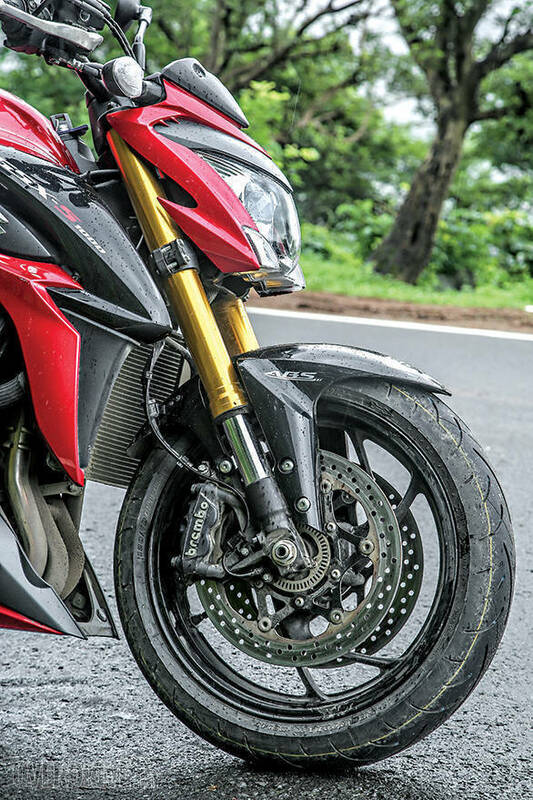 It is an immensely capable motorcycle and has so much performance to offer that it is actually scary. It is also one of the last of the raw super nakeds. 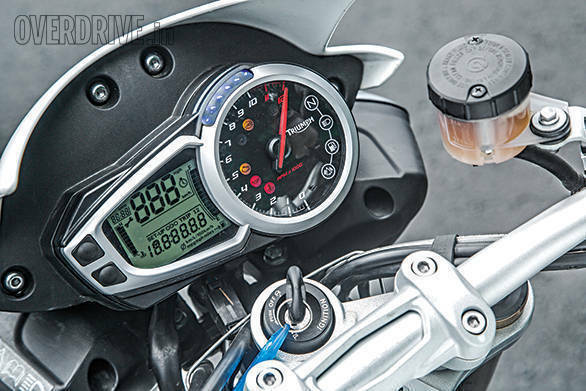 From when the current design was unveiled in 2005, the only electronic aid that Triumph endowed the Speed Triple with was ABS. In an age where electronics is slowly taking over from riding skill, the Speed Triple is one of the last of the originals. This also means that it is a motorcycle that you need to be a bit careful with when coming off of the jet fighter tech that the other bikes get these days. So, if you're going to be ham-fisted, be prepared for 9 o'clock wheelies and 180-degree powerslides. In the right hands, this is a recipe for some serious fun. But for me, the combination made me a bit nervous. Only initially, though. After you've gotten used to the power delivery, you can actually have a lot of fun on this Triumph. The first thing that I noticed when I climbed into the saddle was how big the Triumph actually was. It is not one of those motorcycles that shrink around you once you're aboard. It feels just as big as it looks. It also felt quite heavy and unmanageable, thanks to my racer boy build (Haha! Good one - Ed). But the trick with the Speed Triple is to manhandle it and make it behave. If you act all tender and loving, the motorcycle feels heavy and lazy. But the moment you grab it by the neck and throw it around, the Triumph starts responding to you beautifully. Throw it into corners and it changes direction quick but remains stable. Open throttle and it picks itself up predictably. And the fact that the throttle is so smooth (although it is a bit heavy to operate) only adds to the confidence. Besides, a twitchy throttle without electronics isn't all that good an idea anymore, I guess. But for all its abilities, the Speed Triple has a few flaws. Unlike a lot of the latest motorcycles, it is not easy to live with. The clutch is super heavy in rush hour traffic, and your forearms will cry in pain. The brakes, although they have great bite and stopping power, needs some effort. It also isn't as well balanced in terms of mass centralisation as the other two motorcycles here, so you end up a bit nervous about the 214kg kerb weight. However, that is not the Speed Triple's Kryptonite. The biggest disadvantage of the Speed Triple is its age. 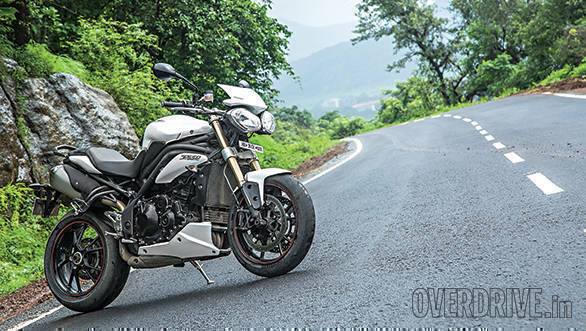 With no major updates coming its way since 2005, the Triumph is well beyond its shelf life. But there's a fix on the way. Internationally, the new Speed Triple is already on sale. And if reports are to be believed, it is one hell of a motorcycle. But we'll have to wait to find out when we will get to own these. Why you do this Triumph? Why? (Insert dramatic weeping here). My point is, the Suzuki GSX-S1000 is as close to Japanese steel as you can get with a super naked. It looks as dangerous too - sort of like a sabretooth baring its fangs. It's not a face you'd want to see coming at you in your mirrors. And when it gets going... Oh man, is it quick or what! The GSX uses the same long-stroke motor as the K5 GSX-1000R. Remember that one? If the name is familiar, you'll know what I'm on about. In this avatar, the 999cc inline-four makes 144PS and 106Nm on paper. However, there are rumours that the motor actually makes upwards of 160PS. 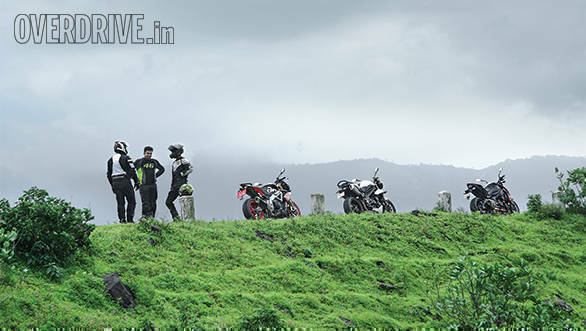 Whatever the case, the motorcycle is capable of doing speeds upwards of 210kmph and 0-100kmph runs in 3.59 seconds. That is serious performance. And to get a feel of it, all you need to do is open the throttle fully. If you've got the globes for it, that is. The sense of acceleration is so mind-numbing that most people will back off before the Suzuki reaches its full potential. Flat-out acceleration is so powerful that you'll have the front wheel pointing skyward through the first three gears if you're running the lowest intervention mode in the three-level traction control. And what's better is that this incredible performance is accompanied by incredible rideability. In top gear, the motor can do anywhere from 30kmph to upwards of 200kmph. It really is the Scooty of the super naked world. But what I really like about the Suzuki is that butter smooth inline-four. There are very few things that are better than a screaming inline-four in my books. The engine delivers performance like soft Pashmina wool running through your fingers. However, the dampener to all this is the sensitive throttle. 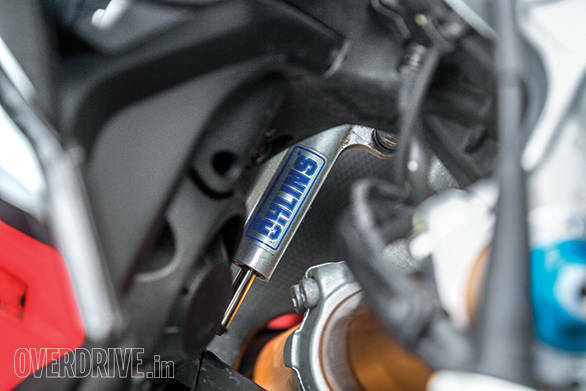 The GSX-S1000 has a twitchy throttle that needs surgeon like hands to be smooth. 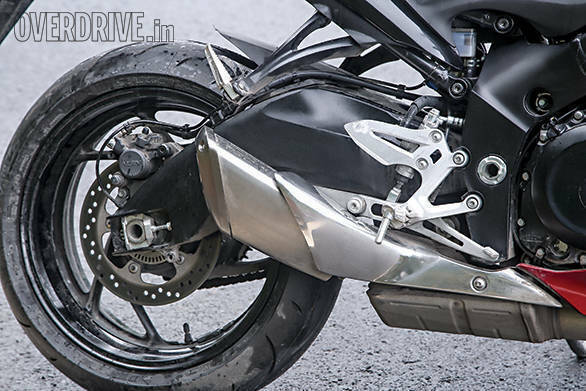 This becomes especially apparent during mid corner throttle corrections which make the bike all twitchy. That said, it is a super friendly bike to ride around even in heavy traffic. The motor never overheats, the clutch is super light and the great mass centralisation lets you trundle around in traffic without the 209kg kerb weight ever feeling unmanageable. And if you do a bit of clutch management, the snappy throttle also ceases to be a bother. 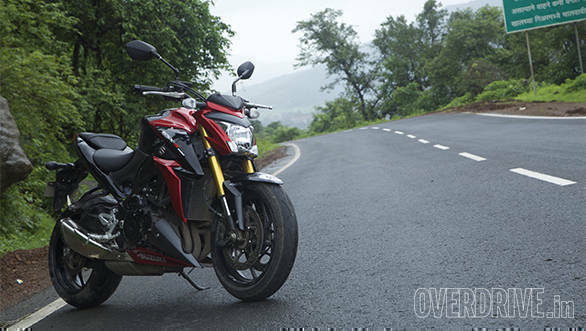 The GSX-S1000 is also an eager handler. The turn-in is super quick and the direction changes, even if through back to back switchbacks, require no effort at all. But the eagerness comes at a cost - precision. The Suzuki feels a bit overeager if you start throwing it around. It requires a bit of a gentle hand. And when fully leaned over and when accelerating hard, the front end feels a bit light. Not a very confidence inspiring feeling, that. Especially when the front end does a little wiggle when you bring it back to earth at an angle. The brakes too aren't that great and lack stopping power when compared to the other two bikes here. I also felt a small amount of brake fade under hard braking. But to be honest, if you are in the market for a reasonably priced litre-class super naked, then the GSX-S1000 is the way to go. 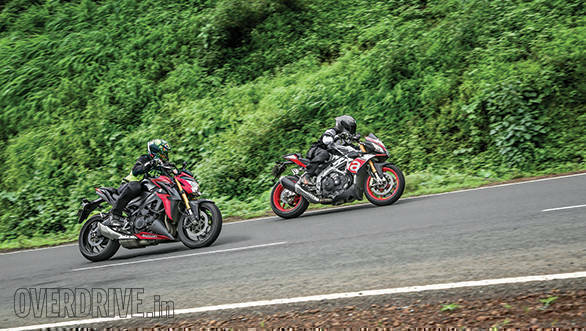 The Z1000 feels tediously short geared, and the FZ-1 and the CB1000R are now too long in the tooth. Besides, that Hattori Hanzo sharpness is guaranteed to leave you wanting for more every single time. I'll take one in blue, domo arigato! 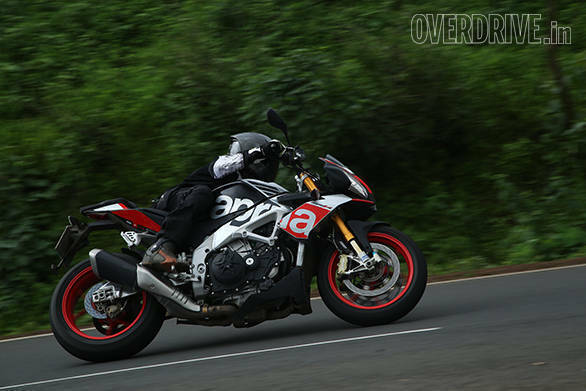 If there ever was a competition for the most aptly named motorcycle in the world, the Aprilia Tuono would win it. Tuono translates to thunder in Italian and that is exactly what this bike is. It is Mjolnir being thrown at your face with all of Thor's might. It is thunder that awakens all of your senses at once. It is truly special. Don't believe me? 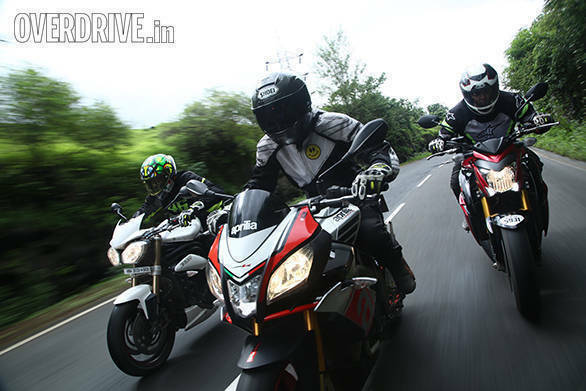 Head to your nearest Aprilia dealer and beg, bribe or threaten him into starting up a Tuono for you. You'll know exactly what I mean. The soundtrack on this motorcycle is so outrageous that I have no idea how it is even legal. Gentle blips of the throttle sound like thunderclaps. And don't even ask me what it is like to whack that throttle open. Why? Because I never had time to pay attention to the sights and sounds whenever I opened the throttle fully. I was too busy getting my mind blown into pieces with the sheer violence with which the Tuono delivers its acceleration. I'm talking about that 1,077cc V4 with its 175PS and 121Nm which pulls you to 100kmph in a mere 2.9 seconds. And I hear more skilled testers have managed as low as 2.6 seconds too! Add that to a top speed of well above 240kmph and that's just plain ridiculous. But what is truly remarkable about the Tuono is that at no point through all this manic acceleration does it feel like its teetering on the edge of control. It stays focused and relentless in its pursuit of warp speed. This motorcycle is magic. From the moment you park your backside on it, there's an incredible sense of oneness with the Tuono that I have not felt on any other motorcycle. Everything feels tailor-made to fit you. And not just me, everybody who rode it said the same thing. You feel plugged in. And this feeling is carried over to the way it rides too. It is almost as if the motorcycle has started to read your mind and is doing everything you want to do without a moment's hesitation. You want it to turn, it turns without the slightest hesitation. You want it to go, it goes like it's got an Acme rocket strapped to its back. You want it to stop, and it stops before you can finish saying "stop". It does every single thing you ask of it! 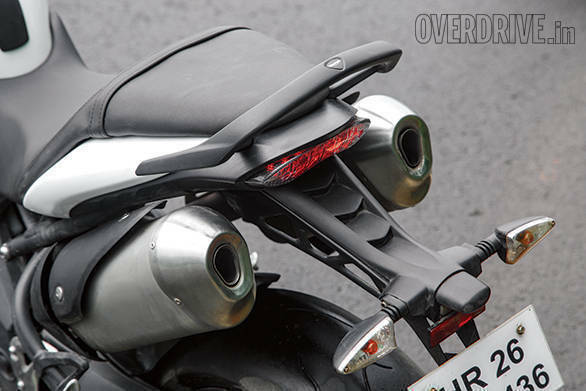 But the most incredible thing about the Tuono is that it makes you feel indestructible. The moment you start riding, you feel like you've been bestowed with more riding skill than you ever thought possible. Before you know it, you'll be going faster, leaning farther, and braking later. All without ever doubting your or the motorcycle's ability. How is that possible? 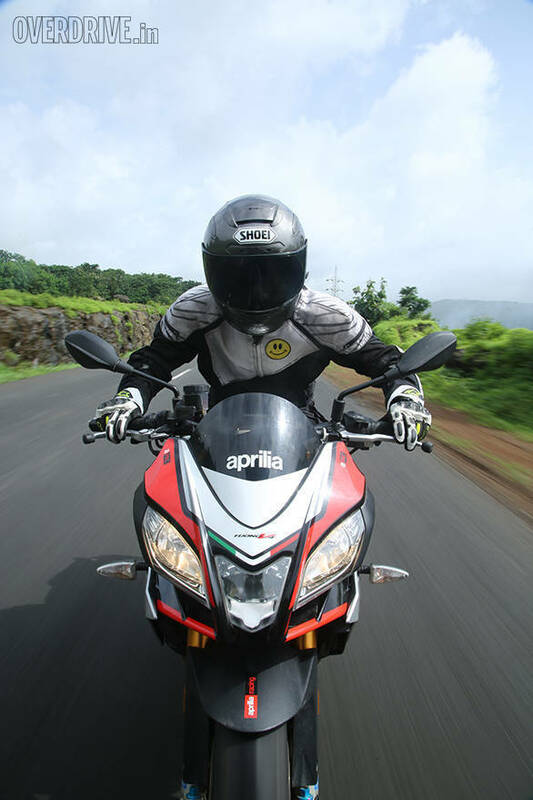 Thanks to the incredible electronics that the Aprilia comes with. The Tuono comes with eight-level traction control, three-level wheelie control, three-level launch control, three-throttle maps, a quickshifter and three-level ABS. And if I hadn't told you about the electronics and sent you out to ride it, you would never be able to tell. 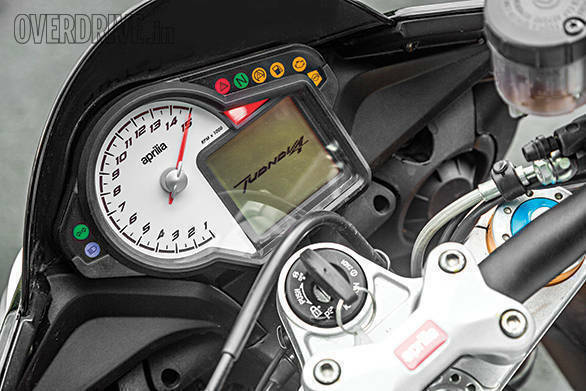 The Aprilia's electronics package is the most non-intrusive bit of gadgetry that I have experienced on any bike till date. You cannot tell that it is working. Landing the bike cross over a crest? No problem. Opening the throttle on a gravel-filled stretch of road? Why not! Being as ham-fisted as a noob? Bring it on! The Aprilia takes all of this bad behaviour and lets you come out the other side of it all looking like the next big MotoGP star. It really is that incredible! And the way it handles... OH MY GOD! There has been no other motorcycle that I have ridden in my life that has given me as much confidence over all kinds of tarmac. Turn-in is lightning quick, yet accurate. It delivers exactly the amount of direction change that you demand of it and nothing more. And that steering damper does wonder for high-speed confidence. You can jump crests at stupid speeds and land without the motorcycle uttering a word of protest. And thanks to one of the most sophisticated suspension packages from Ohlins, this dynamic ability doesn't come at the cost of ride quality. It has incredibly good ride that takes the game to a whole new level. Beautiful! And it's not just the way it performs that is beautiful. Aside from being an incredible performer, it also looks like million bucks. To me, it is easily one of the most strikingly good-looking motorcycles out there today. A tiny package that looks so purposeful and fast even when standing still. Sigh! I could write for days and days about how much I love this motorcycle. It is really that incredible. I strongly believe that there is not one sane person on God's good earth who would say no to a Tuono. Not even Thor. In fact, tell him you want to trade a Tuono for Mjolnir, and I've got a strong feeling he won't think twice. I'm not going to dilly-dally about here. The Tuono is the best motorcycle here. If I had the money, I wouldn't think twice about spending it. It's really that good. It is as close to perfection as I've experienced in a motorcycle so far. It does everything I want a motorcycle to do and then it makes me do everything I'd want me to do as a motorcyclist. It makes me smile and want to cry at the same time. That kind of emotion I just didn't feel for either of the other motorcycles. In fact, if I had only Rs 25 lakh lying around in my bank, I've got a feeling I would have bought this motorcycle. 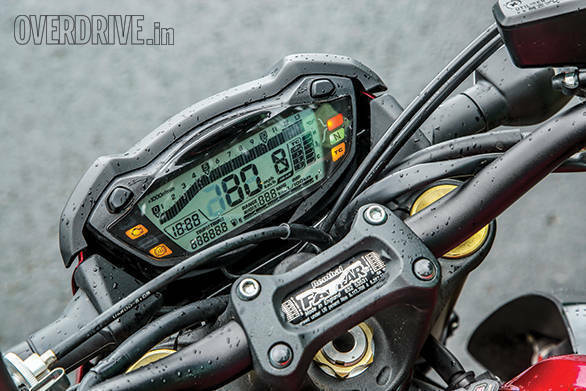 If I didn't and had only around Rs 16 lakh in there, then I'd probably buy a GSX-S1000. What about the Speed Triple? I think I'd just wait for the new one to come and take it from there. 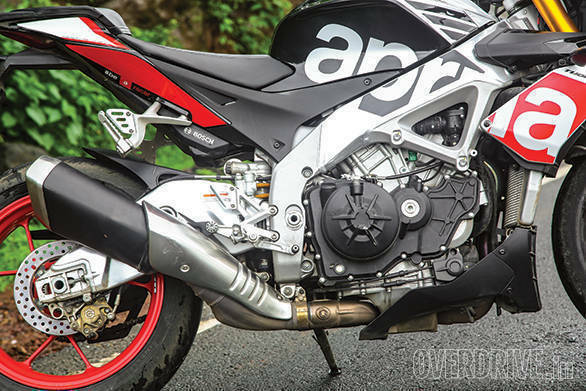 Or better yet, I'd keep all my money and call for a long-term Aprilia Tuono V4 1100 Factory. What say, Aprilia?